Can India Arrest the Slide in its Innovation Ranking? Over the last few years, the Global Innovation Index (GII) compiled annually by INSEAD, WIPO and Cornell University has become the most commonly accepted global indicator of nations’ innovation performance. So, there has been much angst in India over the last couple of weeks once it emerged that India has fallen 10 places in the last year from 66 to 76. I have written about the GII in this blog before. Just by way of reminder, the GII measures national innovation performance by looking at a whole set of variables related to both innovation input and output. 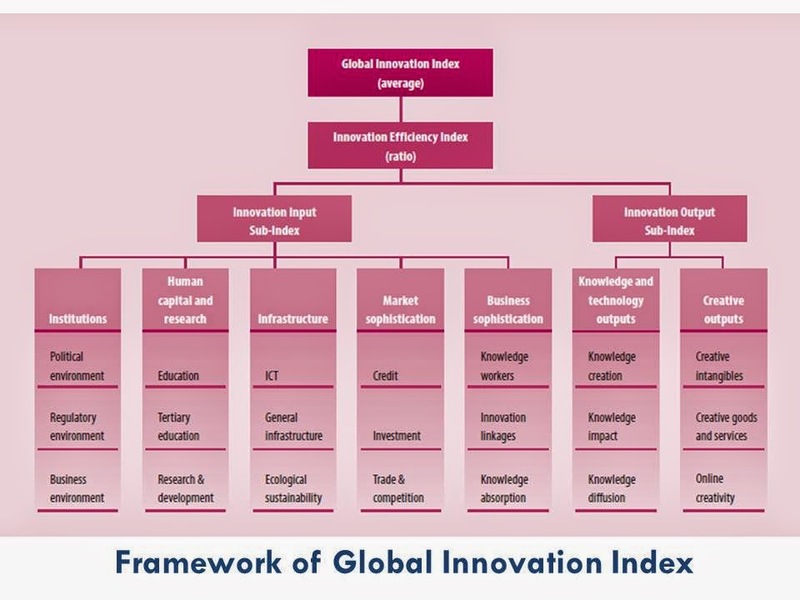 The innovation input index is a function of institutions, human capital and research, infrastructure, market sophistication and business sophistication. 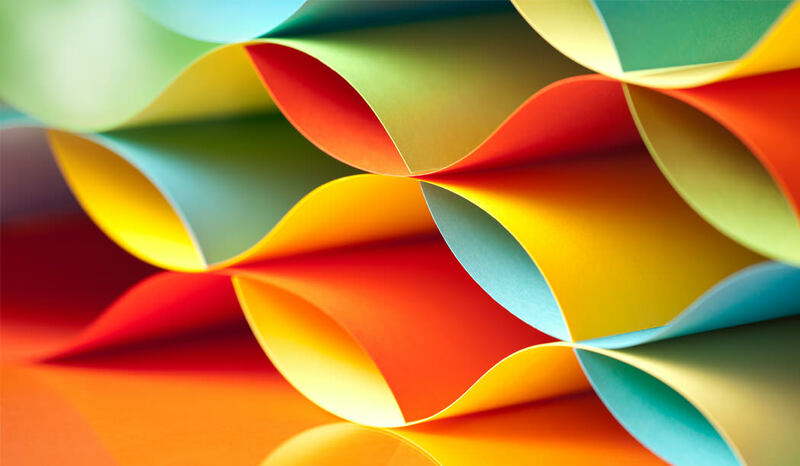 The output index considers knowledge and technology outputs as well as creative outputs. My main reservation about the way this index is computed is that some of the variables are general business climate variables and not specific to innovation per se. I also wonder whether there is a degree of double counting in the index – at the minimum, I suspect some of the variables they measure are strongly correlated with each other. But the good thing about the GII is that it has now fallen into a pattern, is fairly stable in the way it is compiled year after year, and therefore should give us a sense of broad trends even if the exact score computed is not sacrosanct. To see why we are slipping, I took a closer look at the scores of India vis-à-vis China. As the two “emerging market” giants, the world often sees China and India as competitors (though we all know, of course, that China has been ahead of India in the economic sweepstakes). And, to make it even juicier, China’s rank on the GII has been improving unlike ours which has been steadily declining! There is not much difference in scores between India and China as far as institutions are concerned and this has been the case for the last few years. Not surprisingly, China scores much better than India on infrastructure, but many of the infrastructure variables captured in the GII are broad ones like electricity output and logistics performance, and we know that India has a long way to go on these parameters. So, there is no great surprise here. On market sophistication (credit, investment, trade and competition), India has actually pulled marginally ahead of China in GII 2014, though we trailed China last year. Many of the parameters that go into this metric are again broad ones that would go into any competitiveness study and are not specific to innovation. On business sophistication (knowledge workers, innovation linkages, knowledge absorption), China is ahead, but the gap has declined marginally from 2013 to 2014. That’s a good sign, and India is even ahead of China on a couple of sub parameters that add up to this score – state of cluster development and joint venture/strategic alliance deals. Then, where is the slippage and is it a cause for concern? Yes there is a concern, because the most serious gaps between India and China are on two critical parameters that are linked intimately to innovation: the input parameter relating to human capital and research, and the output parameter relating to knowledge and technology outputs. Though we keep emphasizing the importance of leveraging the demographic dividend, and both education and skill development have been flagged for some years now as critical issues, India’s Achilles heel continues to be what is represented by the Human Capital and Research (HCR) parameter of GII. We are behind China on every single component of this parameter. The three main constituents of HCR are (school) education, tertiary education and research and development. On both (school) education and R&D, the gap between India and China is widening fast. Only in tertiary education is the gap narrowing, and that is because of recent improvements in India’s Gross Enrolment Ratio. This assessment of (school) education is corroborated by reports like the Annual Survey of Education (ASER). ASER 2013 shows that while the percentage of children out of school has declined, the percentage of children in Standard V who can read a Standard II text has also declined from 52.9% to 47% between 2009 and 2013. While there have been noteworthy efforts to improve school education including the government’s Sarva Shiksha Abhiyaan (which can take some credit for the improvement in school enrolments) and private efforts like that of the Azim Premji Foundation on the quality side, clearly we have a long way to go before we can ensure a foundation of good schooling to our kids. The R&D issue is more tricky. India’s R&D intensity has remained stubbornly range-bound between 0.9% and 1% for the last two decades. We pride ourselves on our ability to make do with less as exemplified by the achievements of the Space programme in the public sector, and that of automotive and pharmaceutical companies in the private sector. Yet, our adverse trade balance and poor standing in high technology industries (except for a small number of honorable exceptions) show that we have been unable to develop the sophisticated technological capabilities needed to hold our own in global markets. There is a “chicken and egg” problem here – some firms don’t invest in R&D because they don’t have the right people to do R&D. And, in those companies where they do have the right people, the top management does not have the confidence to put enough resources behind the team. 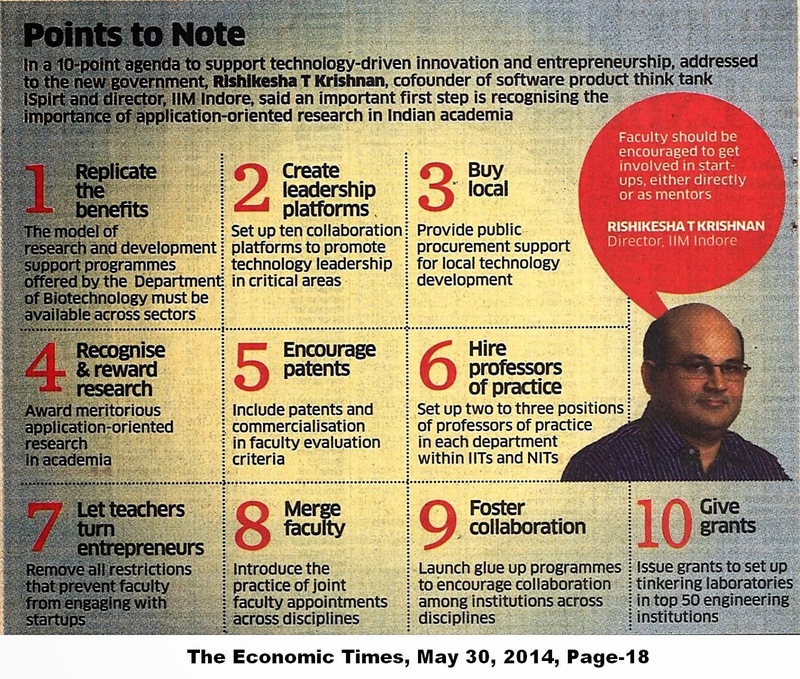 Either way, firms fail to develop a sound R&D and innovation capability. Given these problems, it is not surprising that India lags on knowledge and technology output as well. I have my doubts about the GII’s methodology in calculating the other output parameter – creative outputs. GII shows a huge swing from 2013 to 2014 on this parameter with India well ahead with respect to China last year, yet lagging China significantly in 2014. Since a country’s creative outputs can’t change that rapidly, I am inclined to just ignore this parameter. I am not too optimistic about India reversing this downward trend in GII quickly. Some of the announcements by the new government will help enhance economic institutions, investments and infrastructure if they are pursued seriously. But, it is not clear how and when the slide in human capital and research (as measured by the GII) will be arrested. Some of my pet ideas in this direction are in the slide below. Next PostNext When Should Push and Pull Marketing be Used?